D (Denier) Is a unit of measurement that defines the thickness of each of our polyester bags. Bags that are thicker will have a higher Denier value. I own a business and I thought these bags would be a great promotional idea and I was so right. The way you guys customized the bag for me really worked out. Thank you for the business. Will pass your companies name on to family and colleagues. Loved the wide variety of bags I was able to choose from when customizing. Happy with my investment. Really like the product. My husband and I decided to invest in these bags for promotional purposes. We sold out of this bag at our last convention in a heartbeat and are thrilled. Thank you so much CEP. Our Customized Urban Messenger Bags are made out of strong and durable polyester canvas materials. These eco-friendly bags feature a side mesh pocket and a large main compartment perfect for any use. They also have a sturdy flap with Velcro closure and an organization pocket under flap including a media pocket with earbud port. An adjustable shoulder strap and carry handle make these Urban Messenger Bags comfortable and convenient for daily use. Custom Earth Promos guarantees that these products are an eco-friendly choice that are biodegradable and reusable. Our Promotional Messenger Bags are available in rich, chromatic color options like Black, Graphite, Orange, Red, and Royal Blue. These awesome custom bags have everything you could hope for in a cost effective and eye-catching marketing strategy! Build brand loyalty and foster an environmentally conscious company with Eco-Friendly Urban Messenger Bags. The variety of features these Custom Urban Messenger Bags offer are exceptional! Custom Earth Promos makes sure to deliver only top-quality products to our customers. 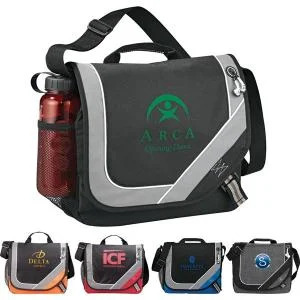 These Promotional Messenger Bags are modern, environmentally conscious and a budget friendly method to advertise your product, service, or brand name. It will definitely keep your company in the spotlight and standing out from the crowd. Our messenger bags are a great choice for commuters, students, and anyone looking for an alternative to a backpack. Custom Earth Promos provides you with the best overall Promotional Messenger Bag for everyday use! These Eco-Friendly Urban Messenger Bags are made from two-tone 600d poly canvas which accounts for their strength and durability. The poly canvas is a sturdy fabric that does not yield to frequent stress or tugs. Even under harsh environmental conditions it will retain dyed color and custom promotional designs extraordinarily well. Just like all of our bags, the Urban Messenger Bags are in line with California's Proposition 65 Regulations and are accredited to be safe for use without any toxic chemicals. Customers will definitely be impressed with these Stylish Urban Messenger Bags when they notice how safe, custom, and reusable they really are. Our Promotional Messenger Bags feature countless convenient qualities that all top messenger bags should possess. It includes a side mesh pocket perfect for easy on-the-go access such as storing your phone, keys, water bottles etc. The large main component is the perfect size for all carrying needs! These bags have more than ample room for all your books or files, along with a padded sleeve for a 17" laptop and a zip organizer pocket. The organizer pocket is great for notes, business cards, pens, and any loose accessories. It also includes a flap that has an impressive, strong Velcro, securing your carried goods. A media pocket with earbud port is also included within the flap allowing on the go music players to be conveniently used. These Promotional Urban Messenger Bags are secured by two buckles, so no need to worry about your items falling out or getting misplaced while traveling! This product also offers a high print quality with remarkable text definition and a large color scale to ensure colorful images and area fills. You'll be able to use these Reusable Messenger Bags as a promotional product for your next business convention, corporate event or industry trade show. The environmentally aware and invested design of these Custom Urban Messenger Bags will have your clients, customers and associates raving about your business. A great aspect about these bags are that they are 100% recycled and customizable, making the perfect go-green campaign for your company! Custom Earth Promos developed these specific Promotional Messenger Bags to be modern, fashionable, and budget friendly to advertise your brand name on an eco-friendly canvas. The Custom Urban Messenger Bags are offered in multiple attractive colors such as Black, Graphite, Orange, Red and Royal Blue. This exceptional variety of colors will ultimately allow you to present your brand in a unique and desired way. You'll be able to easily create virtual samples to weigh its coherence with your brand design ideas! Once you have an individualistic flawless blueprint for your Customized Urban Messenger Bag you'll be set to order. Custom Earth Promos offers numerous options for your company name, logo or tagline to be featured perfectly. Our team is always on call for help with any questions you may have regarding our products, processing and delivery!